It's becoming a tradition for me to grow green beans in late spring when snow peas season is about over. Green beans are easy and fast to grow. Occasionally I had some problems with aphids but I would still get plenty of beans. For the last two years, I started the seeds inside of the garage, my other makeshift green house. This year I just planted the seeds outside in a half wine barrel. I covered it with a protective net for the first month just to prevend birds or squirrels to get in there to eat the seeds. Once the beans start growing, you just need to water them about every other day or even a little less. 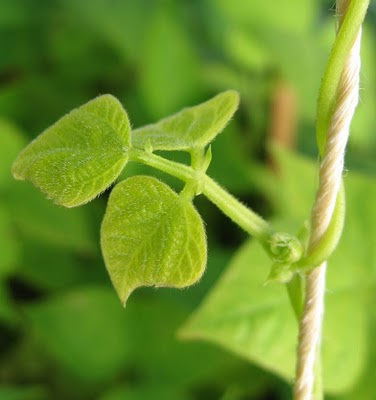 In less than 3 months, you will have fresh tender beans to pick right from your garden. I love green beans for their versatility. You can blanch or steam them and sprinkle a little sea salt as a meal. If you like butter, add some butter. You can stir fry them with some garlic, chili, and soy sauce. If you are really craving for some fat, you can coat them in buttermilk batter and deep fry them. They are so good that you can eat a big plate as a meal.